As Tespa members, college students get access to everything they need to build incredible campus communities, compete in the fiercest competitions, and connect with other gamers on campus and beyond. 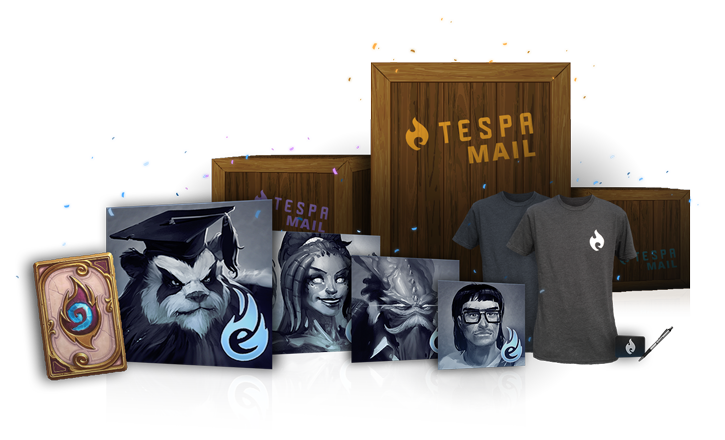 If you're an actively enrolled student at any college campus in the USA or Canada, you can become a Tespa member for free, connect with other students on your campus, earn rare giveaway items, and level up through our member progression program to earn digital benefits! Students looking for the ultimate college gaming experience can upgrade to Tespa Plus, an annual membership that offers rare in-game rewards for your favorite games and a set of exclusive Tespa membership gear and apparel. As a leader of a Tespa chapter, you’ll be taking on the challenge of building a home for college gaming on your campus. Take the reins of your chapter and unite gamers at your school like never before. To support our chapters, we work with partners to build epic campaigns where chapters across North America can host officially-supported events with Tespa prizes and loot to give away. We also provide unique resources and guides like our Chapter Skill Trees to help your leadership team take your chapter to the next level. Whatever your chapter’s ambitions, we're here to help. By joining our ever expanding network, you gain access to a wealth of knowledge and community support from over 250 chapters and their leaders. Our leaders meet regularly to discuss best practices and share experiences to help each other improve. We also employ a full team of chapter coordinators to provide personalized, year-round mentorship and support for our chapters. If you’ve got questions, we have the answers! Tespa is the world's leader in competitive college esports, with 5 year-round gaming leagues and over $3M in scholarships awarded to date. Our mission is to host epic premier leagues that recognize and reward the top competitors and teams in college esports, while also providing year-round open leagues that give up-and-coming players and place to hone their skills. The best players and teams in our esports programs have appeared on ESPN, Twitch, MLG, and other major network broadcasts. For all of our competitors, our dream is to help you support your future through gaming. Our top prizing comes in the form of scholarships; it’s our way of integrating gaming excellence with the opportunity to grow as a student. Playing games is fun, but school should always come first. We believe that competitive gaming can change students’ lives for the better. These are the stories we want to celebrate – and yours could be next!